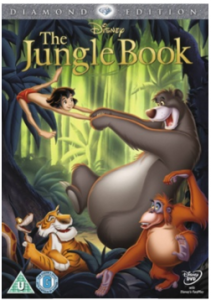 How many of us have fond memories of the 1967 Disney film animation of Jungle Book? Lots, I suspect. I certainly do. Even with my dreadful memory I can still conjure up images of Baloo performing ‘Bare Necessities’ and Kaa’s hypnotic ‘Trust in me’. So when I heard there was a new version, part of me wondered: why? But as I love animals, another part of me couldn’t wait. I wasn’t disappointed. Jungle Book (2016) is truly excellent. It combines some – but by no means all – of the narrative of Kipling’s original Mowgli stories, with a selection of the more iconic aspects of the 1967 film, plus some new elements, to deliver its own up to date take on the story. 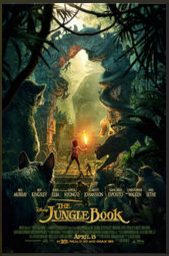 Up to date in the sense that it uses the latest CGI to produce a forest full of animals who appear utterly real, and also in the sense that it explores a number of highly contemporary themes. The impact of climate change is seen in both droughts and destructive downpours. During a drought it is agreed that, for the good of everyone, all hunting is suspended: a level of co-operation in the face of global adversity that perhaps we should all adopt? Witty references are also made to species extinction. If you enjoyed this don’t miss out on future articles. Sign up below and you will get an email with links to my latest posts. Subscribe to receive my latest posts directly to your inbox. Shere Khan’s death is another step change. In the book he is skinned by Mowgli. Skinning a tiger is controversial now and in both films his demise was changed to death by ‘the red flower’ – fire being a symbolic tool of mankind in all versions of the story. But in the new film there is an added twist. As Mowgli collects the fire from the human village and returns to confront Shere Khan he accidentally causes a forest fire, reminiscent of the ‘slash and burn’ destruction than man is engaged in today . Shere Khan points out that this is exactly why man should not be allowed in the jungle. The ch aracters have been updated too – and every voice-over is an absolute treat. Kaa is now female. In the Disney version Baloo was presented as a buffoon; in this version he remains endearing and amusing, but his character is more subtle and very human – the lazy know-it-all full of coaching clichés who gets everything wrong. The elephants, barely present in the book, were a big part of Disney’s version with the rather stereotypical bossy Colonel leading their noisy parade. Now they are much quieter, revered even; they are seen as the creators of the jungle, carving out water courses to extinguish Mowgli’s unfortunate fire. The Disney version also had four vultures with Liverpudlian accents, signifying the Beatles, who rightly do not belong here. Another invention of Disney was King Louis, the leader of the monkeys, who does appear again. In the book the monkeys have no leader, or any morals, and are outcasts. Rules and hierarchy seem important to Kipling, perhaps reflecting his experience of colonial India. The monkeys are still outcasts, but the enemy is not lack of leadership but misrule by a despot – literally a gigantic one – surrounded by his troupe of willing followers. Just as Baloo sings the iconic ‘Bare Necessities’ so Louis revisits ‘I want to be like you’. The songs and silliness worked in the animated version, but Jungle Book (2016) is all about looking real. Whilst Baloo’s renditions did work, I found the giant Louis singing and destroying all around him to be the weakest part of the film. The telling of Mowgli’s history through Kaa’s eyes felt out of place too. The visual ‘realness’ of the animals is at the heart of the film’s strength: even if the elephants were African, not Indian, and many of the animals depicted were a little larger than life. The Law of the Jungle governing the interaction of the animals is emphasised, as it was in the book. It’s not a cartoon – it’s about the real world. Mowgli is a man cub but he wants to be a wolf. This is impossible as he cannot escape his human characteristics. His ability to make things – his ‘tricks’ as his wolf mother calls them – causes disquiet in his animal companions, causes damage as we have seen, but also helps him survive. For ultimately, we are what we are, as Shere Khan knew all along. So, there we have it. Many serious messages, adjusted to our times, delivered with emotion, lots of humour and some nerve-wracking action sequences. As much as I loved the original, by comparison, it does look dated and a little too jolly. Or perhaps I’ve just grown up. Do go and see it – and let me know what you think.